Well, it’s a standard principle to never be overcome with joy when someone loses his or her job. In this instance, we have an exception. El Rancho High School teacher Gregory Salcido has been officially given the axe from his school board. He’s fired. Salcido also serves on the city council for Pico Rivera, California. He was engulfed in controversy after he took issue with student wearing a U.S. Marines t-shirt in January. He was put on leave after the controversy. He rightfully faced an immense backlash across multiple platforms, even at city council meetings. He was fired Tuesday evening. “Think about the people who you know who are over there. Your freaking stupid Uncle Louie or whatever. 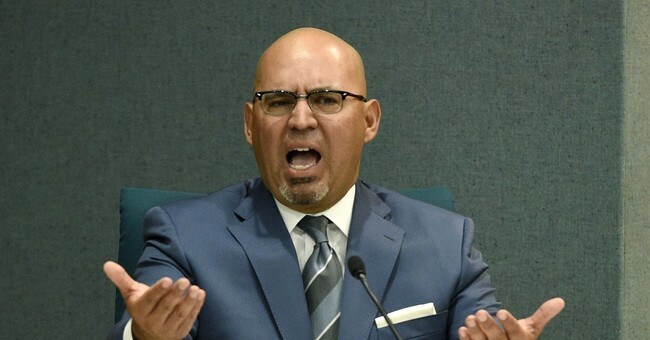 They’re dumbs---s,” Salcido can be heard saying in the Jan. 25 tirade. During a break, he told reporters that he believes the military is the not the “best option” for his students, but added "that does not mean I'm anti-military, because I'm not."